This week I finally got myself organized enough to have lunch at Nordhoff High School. Unlike the elementary schools, one cannot just wander over there and eat lunch whenever the mood suits. One has to alert them a couple days in advance so that Mr. Hall, the vice principal, can verify that one’s motives are not nefarious. Unfortunately for the school lunch reviewer, this takes away the element of surprise usually associated with my visits. Therefore, I cannot verify that my school lunch experience was not a Potemkin Village-type sham, engineered for my benefit, but nevertheless it was overall quite enjoyable. As I walked over to the cafeteria a few minutes before the lunch recess bell rang, I was struck by the quietness of the campus. I could see students through open classroom doors sitting calmly at their desks. There was no running around, shrieking or shouting as I have at times experienced during my visits to the Elementary campuses. Presumably our High School students are diligently studying. Or they could just be sleepy, I suppose. I will digress for a second to point out that the American Academy of Sleep Medicine and the American Academy of Pediatrics have recently issued an official recommendation that school not start before 8:30 am for adolescents. Apparently, it has been scientifically shown that they cannot function properly earlier than that, and forcing them to get up too early contributes to all sorts of societal ills associated with poorly functioning teenagers. 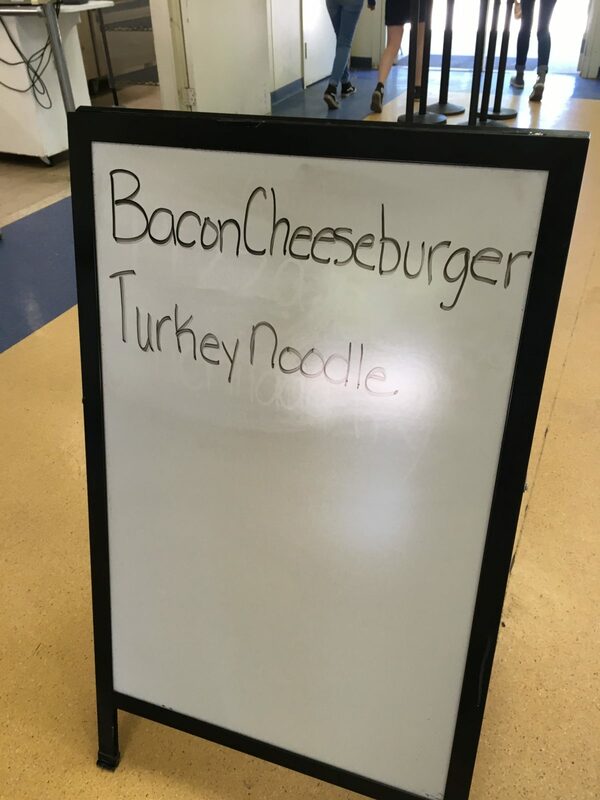 I was greeted warmly by the staff at the cafeteria. There were a lot of them! (This I later realized was key to the remarkably efficient way that the students were served when they all descended en masse about 10 minutes later.) 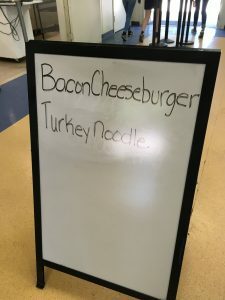 I was initially a little underwhelmed by the two lunch choices that were advertised on the whiteboard. However, as I was ushered in to get my food, it turned out that there were lots of other choices including sandwiches with freshly made focaccia bread, salads, yogurt thingies, and a variety of fruit options. Also the “turkey noodle” looked quite tasty and appeared to be more of what I would describe as a Fettucine Alfredo if I were serving it at home. I’m not much for cheeseburgers, but they looked fine as well. I opted for the salad, mainly because I was informed that the lettuce and snap peas come from Steel Acres Farms. This is an organically run affair in Meiners Oaks that Food for Thought works with and who are involved with the Nordhoff agriculture curriculum in some way that I am always hearing about at Food for Thought board meetings but have trouble wrapping my mind around. 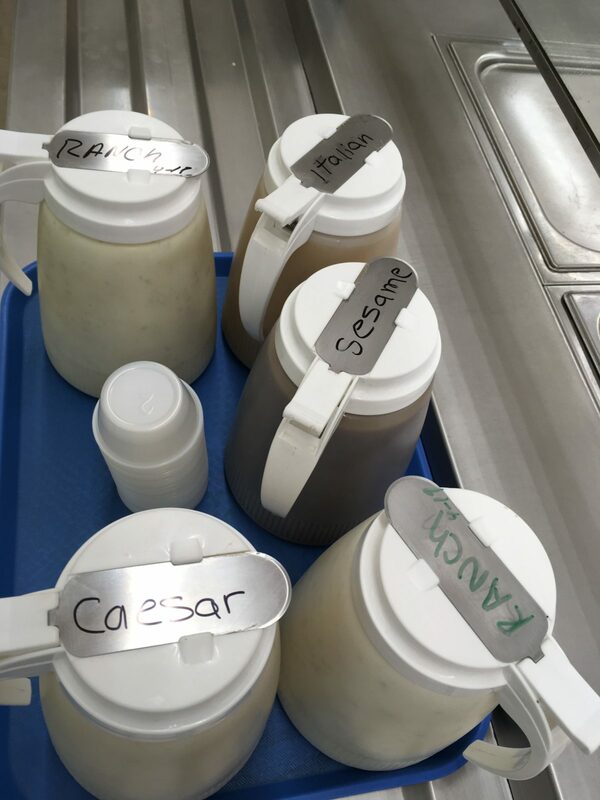 I noticed that, for the first time in my now several year-long career of eating OUSD lunch, I had a really comprehensive choice of salad dressings. I chose Sesame. 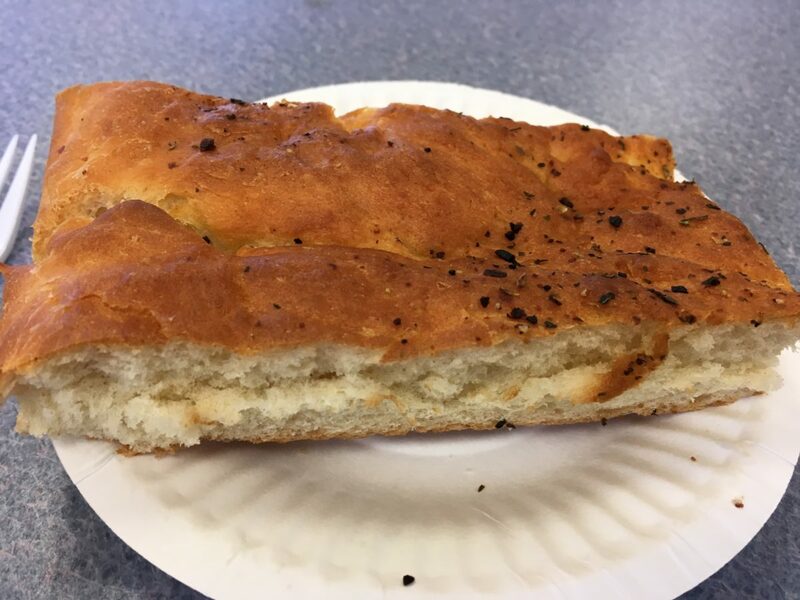 I also got some focaccia bread and some chocolate milk, which was the only thing I saw that looked like it had enough added sugar in it to qualify as lunch dessert. Noticeably missing from the cafeteria, sadly, is a water station or even a drinking fountain. The kids who want to fill up their reusable water bottles (and I saw a lot of kids with those, which gives me some hope for the future of our planet) apparently have to go to the gym for that, which is pretty far away from the cafeteria. Perhaps this is something that Food For Thought and the various other school booster organizations can work on for next year. There was, however, a good selection of strange blue and other dayglo color sports drinks, juice drinks, iced tea, and bottled water available in addition to the usual milk. 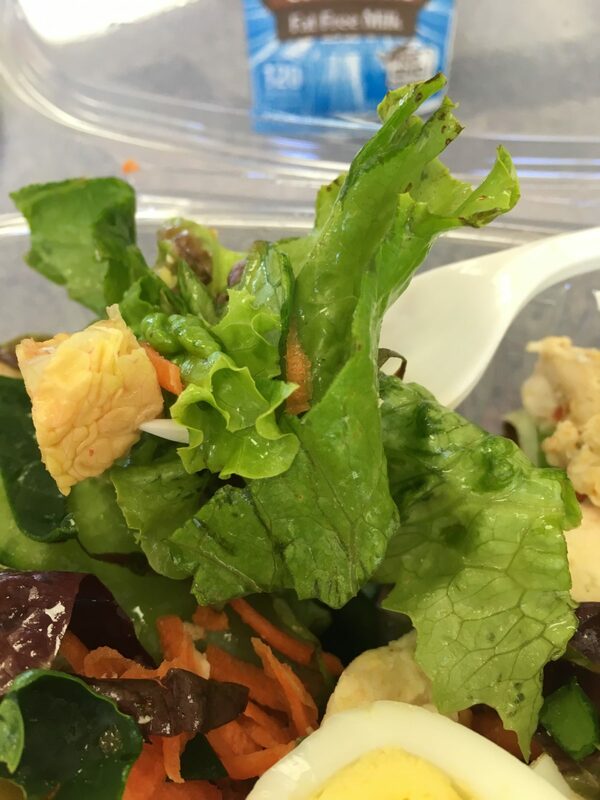 My salad was predictably yummy, including the chicken part of it. I don’t pretend to be able to tell the difference between ethically raised free range organically grown lettuce and pea pods and regular lettuce and pea pods, but these were good lettuce and pea pods. The focaccia bread was tasty: apparently it is baked on site every morning. My daughter, a freshman at Nordhoff, had assured me she was going to come and eat lunch with me. However, not unlike when she assures me she is going to pick her clothes up off the floor in her room or clean her guinea pig’s cage before she takes off with her friends, this did not end up happening. Luckily I have learned by now not to let it bother me too much. So I sat by myself and observed the students file in, get their food, and proceed to mill about. The line moved quite quickly. The students assembled reasonable-looking food combinations in their cardboard boxes and sat down to eat in little groups. There were some girl groups, some boy groups, some co-ed groups and a few of those prematurely married-looking high school couples arranged around the cafeteria’s round tables. Some guys were playing ping-pong. There was no running around, shrieking or shouting. Dare I say it? They almost seemed… mature. 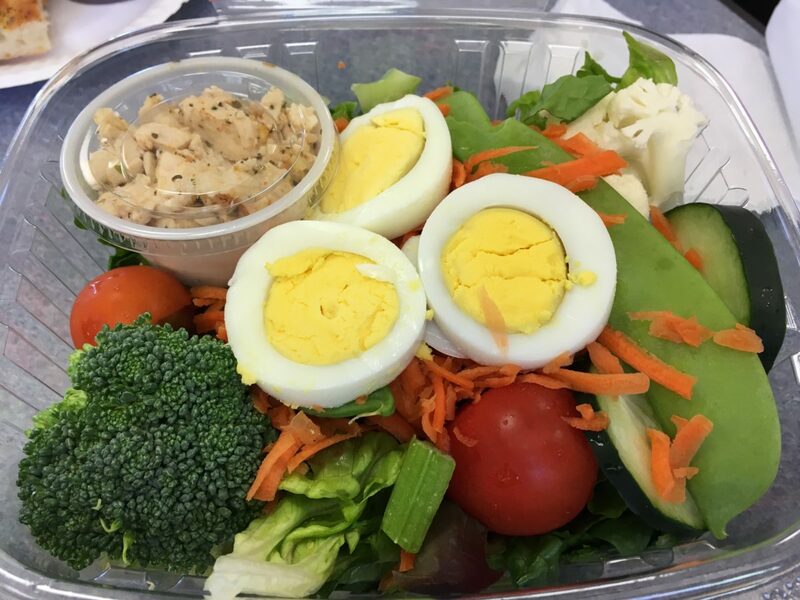 As I compare my lunch experiences at the different campuses across the different grade levels, I have really come to appreciate the way that teachers and staff wrangle our children in developmentally appropriate ways. I suppose there is probably a lot of literature about this that educators are exposed to during their training, or perhaps they just figure it out through experience. In the younger grades, by necessity, there is not much autonomy for the students. 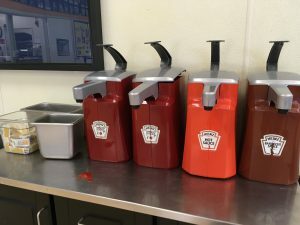 I have observed this at lunchtime as the nutrition services staff and lunch supervisors beneficently yet firmly (and appropriately, I think) enforce the rules that the students who eat at the cafeteria have to take a selection of healthful foods and at least eat some of it before running off to do some shouting and shrieking. In high school, the students are appropriately expected to be more responsible for their own behavior and choices. No one is going to sit them down and force them to eat a nice lunch. My hope is that through participating in programs as elementary students that emphasize the importance to themselves and to the planet of eating in a healthful and responsible way, our high school students will be inclined make good choices at lunch and in their lives.